We are one of the most sought-after Submersible Cable Manufacturers. The PVC Insulated & Sheathed 3 core flat submersible cables that we deal in are ideal for usage in submersible pumps in deep wells for irrigation (Direct Burial), drinking water supply, industries, mines, fountains. Our company is the manufacturer of a wide range of Submersible Flat Cables that are designed as per ISI 694:1990. The Submersible 3 Core Flat / Round Cables are amongst our best products offered to the clients. Sheathed Round Submersible Cables are made from bright electrolytic grade copper and a proper care is taken to ensure their highest flexibility and uniform resistance. All our Submersible Pump Cables are highly durable, and we provide these to our client's at the most competitive prices, which are the best in the market as compared to the prices offered by our competitors. 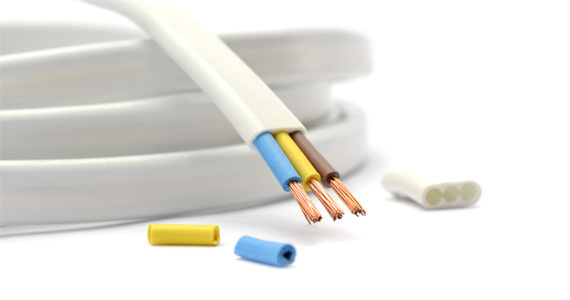 Cable Design: Relemac 3 Core Flat /Round Cables are manufactured keeping in mind the severe and difficult conditions in which they are required to perform. The area of installation is physically restrictive, and the environment is very hostile. Relemac is designed and manufactured keeping in mind these factors to achieve the highest possible degree of reliability.These are used to connect submersible pump motor with supply lines, The slot available in the tube well being narrow the shape of the cables has to be suited for such an application. Certain striking features of our Flat Submersible Pump cables include excellent resistance to water, moisture, abrasion, grease, oil, long flex life, excellent mechanical & electrical properties. 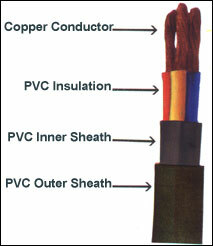 CONDUCTOR PVC INSULATION PVC SHEATH CURRENT Rating at 40°C Amps. Approx Weight Kg./Km.